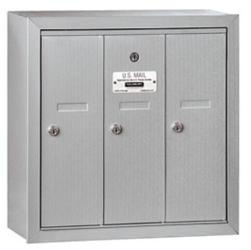 U.S. Mail Supply’s inventory of heavy duty steel & aluminum constructed residential and commercial locking mailboxes include indoor horizontal & vertical mailboxes and outdoor pedestal cluster mail box units. 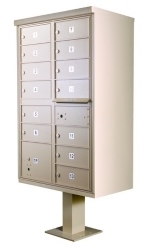 Shop big and small lockable surface mounted or recess wall mounted indoor horizontal mailboxes or choose freestanding pedestal mailboxes for multi-tenant apartment complexes in need of large mailboxes with many compartments, slots or package drops. 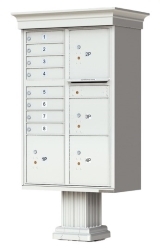 Shop lockable indoor 4C mailboxes or outdoor pedestal cluster mailboxes for apartments. Choose vintage / Victorian style decorative pedestal mail boxes for luxury or high end apartments, condos or town house subdivisions. 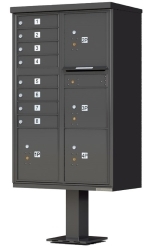 USPS approved 4C horizontal mailboxes and 4C pedestal mailboxes for private delivery offer excellent flexibility and security for commercial properties like offices, employee storage, gyms or schools. USPS approved mailboxes are manufactured in compliance with strict USPS regulations and requirements. When in need of USPS delivery mailboxes, start here. 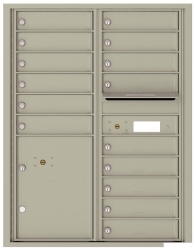 U.S. Mail Supply offers a huge variety of options for apartment mailboxes, including easy installation pedestal mailboxes in several colors for outdoor mail delivery and small indoor horizontal or vertical mailboxes. 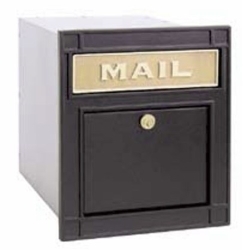 Shop modern outdoor mailboxes for sale from U.S. Mail Supply. Pedestal mount mailboxes come in a variety of door and slot options, package lockers, and outgoing mail slots, with color choices to complement any building's decor. 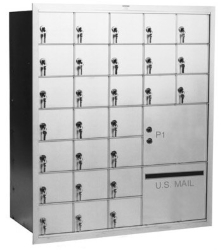 Indoor horizontal and vertical mailboxes can be customized with the number of slots you need for tenants in your building – with diverse locking options to provide maximum security for your tenants’ or employees’ possessions. Shop traditional post mounted curbside mailboxes for single or double family homes – or elegant wall mounted mail houses for town homes or condos. 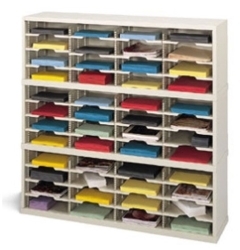 U.S. Mail Supply has a great selection of mail sorters – flexible to adapt to your space availability and storage requirements. Heavy duty metal construction keeps belongings safe and secure. Both indoor and outdoor mailboxes are under a constant security threat from harsh environmental conditions and vandalism. Metal mailboxes from U.S. Mail Supply are American-made and built to handle heavy daily use. If you need any assistance choosing the right mailbox for your needs, give us a call and we’ll help you find a solution. If you have any questions or need any assistance in purchasing the mailbox you need for your space, fill out one of the forms linked above or give us a call for support.